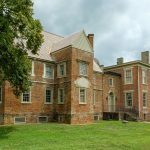 The Ben Venue Plantation House is the central building to one of the best preserved mid-19th century farm complexes in Virginia. It is located just south of Flint Hill in Rappahannock County Virginia. 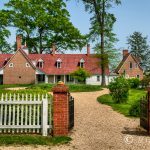 As the land in the Tidewater area of Virginia began to wear out in the 18th century, the early settlers began moving west. The rolling hills of the Piedmont area below the Blue Ridge Mountains provided the rich soil needed for settlement. By the early 19th century, the area of Rappahannock County was growing in prosperity as symbolized by large farmhouses with their associated outbuildings that formed the nuclei of large landholdings. One such large landholding was the Ben Venue Estate. The land on which the Ben Venue Estate sits was a tract of 1,556 1/2 acres owned by William Fletcher. 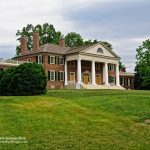 The house is believed to have been constructed by James Leake Powers, who reportedly worked under Thomas Jefferson on the University of Virginia. 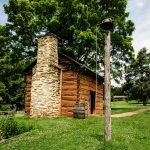 Although there is no documentary proof that Powers had been involved in the construction of either the Ben Venue Plantation House or the University of Virginia, the cellar chambers at the Fletcher house are an unusual feature which have been derived from similar examples at Monticello. The house was built between 1844 and 1846. 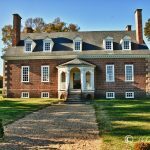 It has many elements of the Greek Revival style which was very popular in Virginia ca. 1820-1866. It is constructed of brick laid in Flemish bond and painted red. The facade is dominated by a one story porch that covers the three central bays. The windows in the house are of the original style – 9/9 hung sashes on the first floor and 6/9 on the second. The house has a formal boxwood garden to the front that provides a nice contrast to the surrounding fields. 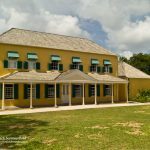 The Ben Venue Plantation House and the surrounding farmland is private property and is still owned by William Fletcher’s descendants. 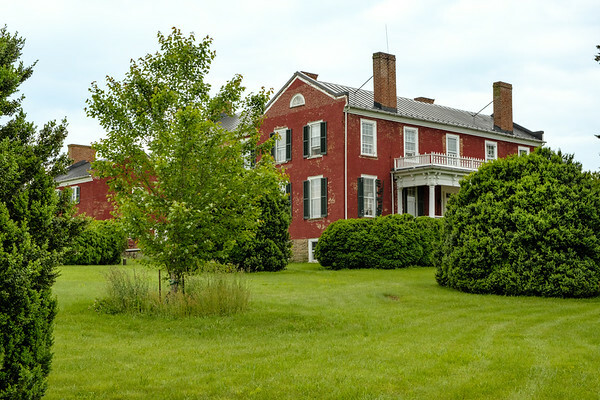 The Plantation House together with approximately 73 acres and numerous other buildings associated with the main house and the farm was listed on the National Register of Historic Places in December 1979. 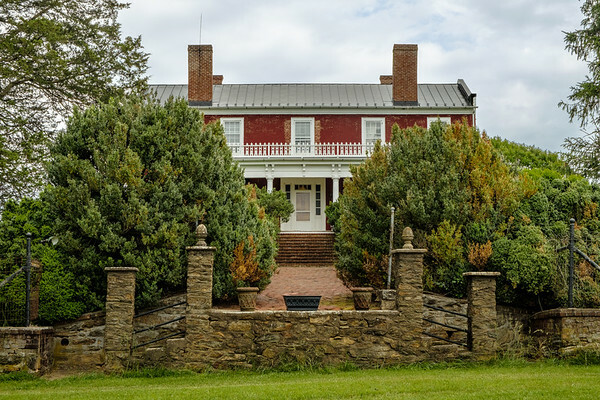 The Ben Venue Plantation House in Rappahannock County is the central building to one of the best preserved mid-19th century farm complexes in Virginia.